Who doesn't need a visa to visit Italy? 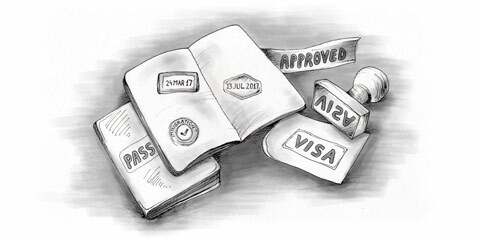 European Union (EU) nationals don’t require a visa for stays of up to 90 days. Andorra, Argentina, Australia, Benin, Bolivia, Bosnia-Herzegovina, Brazil, Burkina Faso, Canada, Chile, Colombia, Costa Rica, Croatia, Cyprus, Czech Republic, Ecuador, El Salvador, Estonia, Fiji, Guatemala, Guyana, Honduras, Hungary, Iceland, Israel, Ivory Coast, Japan, Kenya, (South) Korea, Latvia, Liechtenstein, Lithuania, Republic of Macedonia, Malaysia, Maldives, Malta, Mexico, Monaco, New Zealand, Nicaragua, Niger, Norway, Paraguay, Poland, Samoa, San Christopher and Nevis, San Marino, Singapore, Slovakia, Slovenia, Switzerland, Togo, Trinidad and Tobago, Uruguay, USA and Venezuela. All other nationalities require a visa to visit Italy for any period. Citizens of many EU countries can visit Italy with a national identity card, while all others require a full passport. However, while identity cards are accepted at all points of entry to Italy, the Italian authorities may not accept them when applying for a permit to stay. If you’re an EU national and wish to remain in Italy for longer than 90 days, it’s therefore highly recommended to enter with a full passport. Since 1st August 1998, Italy, along with a number of other EU member states, has issued a new kind of visa for visitors called the ‘Schengen visa’. This allows the holder to move freely between Schengen countries (Austria, Belgium, France, Germany, Greece, Italy, Luxembourg, the Netherlands, Portugal and Spain). To obtain a Schengen visa, you must hold a passport or travel document recognised by all the Schengen member states and valid for at least three months beyond the validity of the visa. You can apply for a Schengen visa, which is valid for 90 days within a six-month period, from the consulate of the country that’s your main destination or the one you intend to visit first. A Schengen visa isn’t the appropriate visa if you wish to remain in a member state, including Italy, for longer than 90 days, study, take up employment or establish a trade or profession. If you wish to stay longer than 90 days, you must obtain an extension of your visa from the local police headquarters, although this isn’t a right and cannot be taken for granted (you need a good reason and proof of financial resources) and must obtain a permit to stay. However, if your passport hasn’t been stamped (which is likely, particularly for EU nationals), the authorities have no way of knowing when you entered the country, so the system is ‘flexible’. produce a return ticket and proof of accommodation, health insurance and financial resources. When you stay with friends in Italy (rather than, for example, at a hotel or campsite) for longer than three days, you’re officially required to register with the local police, although in practice few short-stay visitors comply with this. Failure to register is punishable by a fine of up to around €220. EU nationals who visit Italy to seek employment or start a business have 90 days in which to find a job or apply for permit to stay, although if you haven’t found employment or have insufficient funds, your application will be refused. If you’re a non-EU national, it isn’t possible to enter Italy as a tourist and change your status to that of an employee, student or resident, and you must return to your country of residence and apply for the appropriate visa. This article is an extract from Living and Working in Italy from Survival Books. Thank you. Your comment will be published once it has been approved by the moderators.